So this has been known by many for a while but I figured I would gather all of the facts for you and shove them here into this little post. For those of you who don't know who Deadpool is, let me take you guys to the side here and have a sit down. Deadpool in a nutshell: Deadpool is the merc with a mouth. Hilarious antics, over the top jokes, and breaking the fourth wall are actually a norm. Deadpool/Wade Wilson's main superpower involves an accelerated healing factor (which he got from an experiment that involved taking cells from Wolverine of the X-Men). The healing factor was intended to cure him of his cancer but this backfired by disfiguring his skin and rapidly regenerated his brain cells which consequently turned him insane. 1) Ryan Reynolds is playing Deadpool. 2) Robert Rodriguez is signing the deal to be the director of the movie. 3) The script was made by the writers for Zombieland. 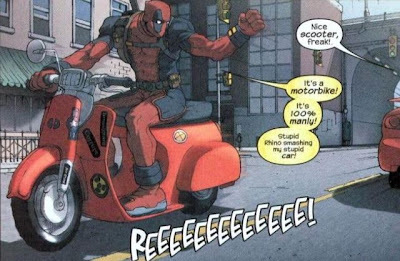 4) It has been confirmed that Deadpool will break the fourth wall as God intended. 5) Ryan Reynolds is a huge Deadpool fan and gets to play the role of "authentication police" for any material presented. 6) Release date is 2011. That isn't a giant pile of info to go on but it's something. The names being thrown around make it sound like this should be a ton of win but we'll have to wait and see. If I find more info I will probably edit this post and add it in later. I've noticed that this article has been getting a strange amount of traffic around the web. For those of you just showing up, I regret to inform you that this post is mostly outdated but don't worry because I've got the updates right here. - Robert Rodriguez won't be the director and instead that role goes to Tim Miller (sigh worthy). - The release date obviously won't be 2011 since Ryan Reynolds just finished up with Green Lantern. - 20th Century Fox is going to release this. - Also starring: Deadpool's love interest Vanessa Carlysle, his pal Blind Al, contact Patch, and Weapon X teammates Sluggo, Wyre, Ajax, and Garrison Kane. This is Kylak signing out and getting ready to repair the fourth wall frequently with duct tape.